Welcome to the Stump Pulling Page! 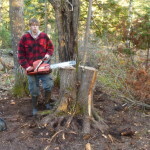 In a effort to collect stumps for woodworking projects, Metsami Creations is offering stump pulling services. 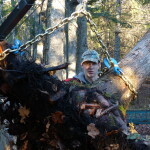 We are mainly interested and most successful in pulling pine and cedar stumps from trees up to 12 inches in diameter, but would try something different. 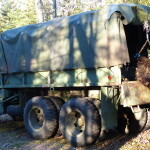 To remove stumps we first cut the support roots with axes and saws, then use the winch or tow straps on the M35A2 to pull the stump out. 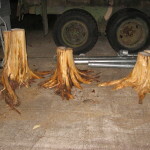 If you have stumps to be pulled this is a great opportunity to get a service done at a great low price and help us with our woodworking needs! Cutting roots around cedar stump before winching. 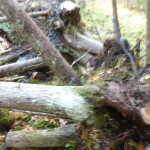 White cedar stumps have been cut out and pushed over. Skidding cedar stump to landing with the M35A2. Bed crane hoist lifting cedar stump. 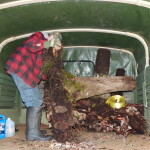 Cedar stump loaded into the M35A2. White cedar stumps in M35A2 bed. 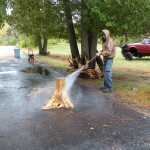 Debarking cedar stump with pressure washer. 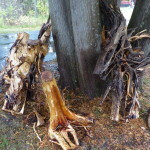 Cedar stumps after debarking and flattening.